Is microchipping included in the adoption fee? How long does it take to complete an adoption? Can I put a "hold" on a cat? Does ASAP verify that I can have a cat at my residence? Why do some cats have to be kept "indoor only?" Can I adopt a cat as a gift? How old does a kitten have to be before it can be adopted? Does ASAP euthanize cats for population control? What is the difference between ASAP and the Humane Society? Does ASAP care for feral cats? Can I bring my cat to ASAP for spaying/neutering or vaccinations? Can I board my cat at ASAP? Can I bring my cat to ASAP to be microchipped? How do I make a donation to ASAP? How do I become a volunteer at ASAP? Are there other ways I can help ASAP? Visit ASAP and get to know the cats. The volunteers can help you find cats that will fit your particular situation. Complete the Adoption Agreement and write your name, address and phone number on the cat's cage card. The ASAP volunteer will verify that you can have a cat at your residence and will go over the cat's veterinary record with you. Take the cage card and veterinary record to the Animal Control office and pay the adoption fee to the County of Santa Barbara. Bring your receipt back to ASAP, get your adoption folder and pick up your cat! The fee to adopt a cat from ASAP is currently $75.00. This fee is paid to Santa Barbara County and is subject to change. Please note that if you wish to make a donation to ASAP, it will need to be done separately. Please see below for more information on donations. Yes, the County Office accepts major credit cards, checks and cash. Health evaluation, including testing for Feline Leukemia (FeLV) and Feline Immunodeficiency Virus (FIV). Cats thought to be 10 years or older receive a full blood panel evaluation, thus assuring that the cat is indeed healthy and adoptable. Yes. Each cat and kitten adopted from ASAP is microchipped free of charge, ASAP will forward your information to the microchip company and your cat will be registered for the rest of its life. Please allow a minimum of 1/2 hour to complete the adoption process. The County Animal Control office requests that adopters arrive at their counter no later than 4:30 Monday-Friday and 3:45 on Saturday. No, ASAP does not hold cats. Yes. Verification of home ownership of adopter and/or landlord is obtained through Santa Barbara County Assessor's records and landlord approval is mandatory. There are several reasons. Cats with white or pink noses or ears are very susceptible to skin cancer and sun damage. Declawed cats must be kept inside because they have no way of defending themselves if confronted by another animal. FIV+ cats must be kept indoors so they can't infect other cats. Some cats simply have always been indoor cats, and we feel they should remain so. Click here for more on "What the Indoor Cat Misses." No. Cats must be adopted by their new owners. If you wish to pay for an adoption as a gift, please invite your friend or relative to the shelter so that they can pick out their cat and complete the forms. Then, you can pay for the adoption. Since all kittens must be altered before they can be adopted, ASAP rarely has adoptable kittens available before the end of May or the beginning of June. The season generally lasts through October, with July through September being the best months to find a kitten of your choice. It is unusual for ASAP to have kittens during the winter months. Kittens must be 2 lbs. before they can be spayed/neutered. Generally, they are 10-11 weeks old. No. ASAP works to eliminate the practice of euthanizing cats for reasons other than terminal health and/or serious behavior problems. Any animal that can be adopted or made adoptable through socializing or medical intervention is cared for until it is adopted. No cat has been euthanized for population control since 1990. 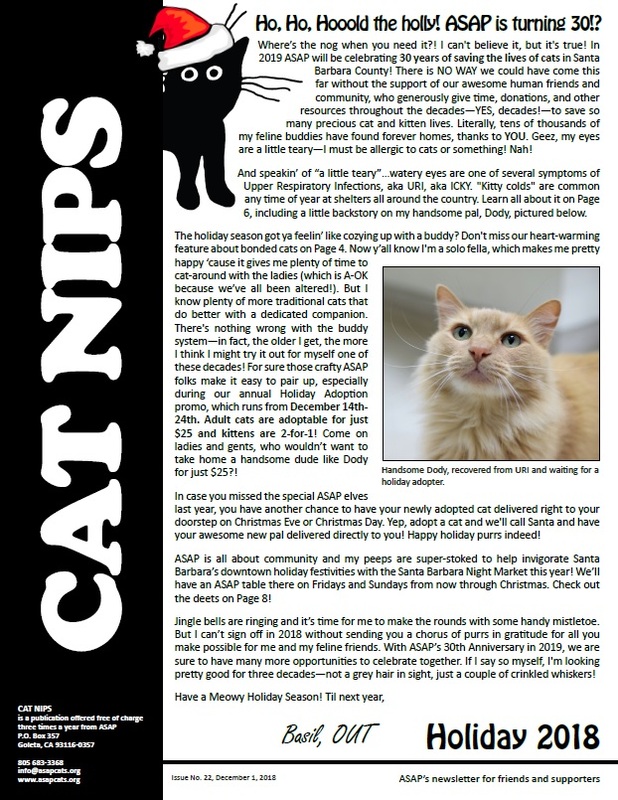 ASAP's mission is to care for and place in new homes tame-but-stray or abandoned cats that are accepted by Santa Barbara County Animal Services. ASAP does not directly accept cats. In special circumstances, owned cats may be accepted by Animal Services for a fee. The Santa Barbara Humane Society is a private organization, which takes only animals turned in by their owners, at no cost to the owner. The Humane Society is located at 5399 Overpass Road and their phone number is (805) 964-4777. No. ASAP provides these services only for cats under the care of the County Animal Shelter. Please check the listings for Veterinarians in the Yellow Pages. No. Please check the "Pets and Animals-Kennels and Boarding Services" section of the Yellow Pages for boarding options. SB County Animal Services offers this service for all cats and dogs. The regular charge to microchip an owned animal is $40 however Animal Services periodically offers promotional discounts so we recommend you call them at (805) 681-5285 to verify the price. There are a number of ways to donate to ASAP. Please take a look at our Donations page. Volunteers attend a 2-hour training session. Please see our Volunteer page for more information. Please see our Donations page for other ways to help ASAP.